In the latest Haunted Home Renovation mystery from New York Times bestselling author Juliet Blackwell, San Francisco contractor—and reluctant ghostbuster—Mel Turner gets hired for a job that's to die for. Lately, Mel has been worried about finding enough historic renovation work to pay the bills. But while Turner Construction is in need of a project, Mel’s boyfriend, Graham, has his hands full managing the reconstruction of an ancient building shipped over from Scotland. With the job plagued by rumors that the stones are cursed, Graham brings in Mel to look for paranormal activity. And while the ghost of a charming Scottish clansman does seem to be hanging around the site, the real shock comes when they stumble upon a body. 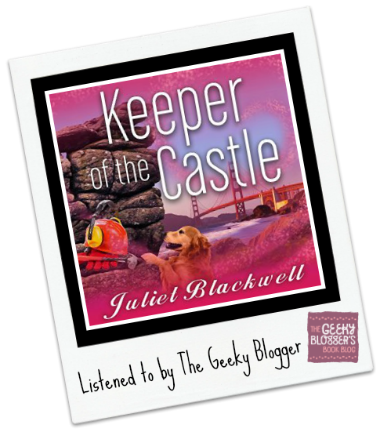 First Thought when Finished: Keeper of the Castle by Juliet Blackwell was not my favorite in the series but still full of the characters and solid writing that I love! Overall Thoughts: Juliet Blackwell writes my favorite cozy mystery characters! She really does have a great way of bordering that amateur sleuth without knocking down the police in the process. Both of her series are excellent. I was a little disappointed that the ghosts weren’t a bigger part of the mystery in Keeper of the Castle but otherwise the case was solid. So overall this was a great listen and as always you will learn a bit of history surrounding her current renovation (always a nice bonus)! Xe is excellent at this series. Seriously she nails it and in this one she displayed some great new accents for new characters. It was a fantastic listen! NOTE: Love that the book she is reading during the story is Keeper of the Castle—clever Juliet, Clever! I have had this series on my wishlist for too long now, I really want to read some of her books. I think I have read two other books by her, a clothes shop? Oh this is a delightful series. I am counting down to the next one! I read the first book in her other series, and liked it okay but haven’t felt compelled to continue. I think I might like this sereis a b bit better.